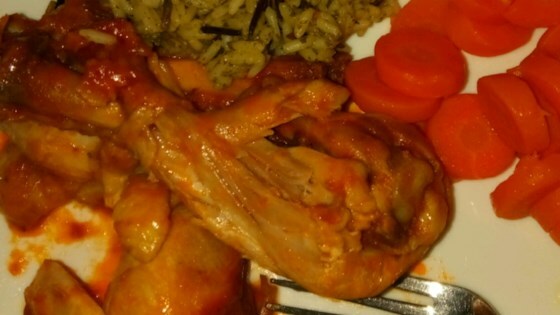 "Chicken thighs prepared with onions and tomato paste, seasoned with turmeric and stirred together with carrots and potatoes. Serve hot over cooked white rice, if desired. Make sure that a nice amount of the chicken 'gravy' is served on the rice!" Heat 2 tablespoons olive oil in a large skillet over medium high heat. Add onions and turmeric and saute; when onions are brown, add chicken and saute for about 10 minutes, or until chicken is almost cooked through. Add tomato paste, water and salt and pepper to taste. Stir together, reduce heat and simmer for 20 to 30 minutes, during which the 'gravy' should thicken. Meanwhile, put carrots in a small saucepan; add sugar and cook until carrots are soft to caramelize. When cooked, drain carrots. Heat 1 tablespoon vegetable oil in a small skillet over medium heat, add carrots and saute. Set aside. Heat remaining 3 tablespoons of vegetable oil in a large skillet, add potatoes and fry. (If desired, add a pinch of turmeric and a pinch of salt.) Add carrots and potatoes to chicken, stir all together and serve. Quite tasty. Made it exactly as the recipe instructed, and have no regrets.